- Toys are stored within easy reach at the side of the bathtub or shower. - The innovative scoop design allows for efficient drainage and air circulation to dry and protect toys when not in use. The unisex purple and green colors make this a great product for both boys & girls. This popular bath scoop also makes a great present for baby showers, new mums and toddler birthday parties. The scoop can also be used as an efficient space saver for adults' shampoo, shower gel and bath products. In the unlikely event that you are not 100% happy with your purchase, simply contact Amazon customer support for a full refund. I love this product and I am buying a second one for our other shower. It's the perfect size, hangs easily on the wall, and most importantly for our family it is BPA, Phthalate & PVC-Free! I like that the water drains out of the scoop so the toys aren't sitting in water, preventing mildew from growing as fast. My girls also love playing with it in the bath as a toy. The bath scoop really helps clean up the bath area making the area not look as cluttered with toys. This bath scoop will make a great gift for a baby shower and/or a baby-toddler birthday. I highly recommend this bath scoop, and with a money back guarantee you have nothing to lose. I ordered mine from Amazon (BUY HERE), and shipping was fast. I did have to contact customer support regarding a question and they were super helpful. Shop for cute kids clothes online with FabKids. FabKids delivers high quality, ready-to-play boys and girls clothing every month! We like that there is NO OBLIGATION TO BUY. And you can SKIP ANY MONTH - If you are not ready to make a purchase, simply Skip The Month by the 10th and you will not be charged. Skip as many months as you'd like. Sensory development is serious play for your little one! Keep your baby both stimulated and comforted with Bebe Bella Designs Crinkle Toy. This crinkle toy is made with our signature soft minky chenille and is lined with a fun "crinkly" noise that can keep your little one entertained for hours. The Bebe Bella Designs Crinkle Toy is super soft with a crinkly noise that most babies will enjoy. They are small (5X5) making it easy for little ones to grab and hold onto. The crinkle toys ($12) are available in different color patterns for boys, girls, and also available in neutral colors. Bebe Bella Designs has an entire collection of minky chenille for your little one. Check out a demo of this awesome humidifier HERE! Juppy Baby Walker, Review & Giveaway! The Juppy "Momentum" is a solution to a previously recognized but unsolved challenge for parents of babies beginning to walk. Babies strong enough to begin walking but not strong enough to walk alone. The Juppy builds confidence in your baby and teaches balance while you maintain your natural posture, eliminating the grueling task of hunching over while teaching your baby to walk. One size fits all up to 35 lbs. Made from 100% cotton that is machine washable. The Juppy is great for parents with back problems that are not able to bend over to assist their baby when they want to practice walking. The small size is great, making it easy to throw in a bag or purse. One very lucky Happy Green Baby reader will do just that! To enter: Just fill out the RaffleCopter below! Good Luck! I'm excited to share our experience with the GroVia All in One diaper. This cloth diaper retails for about $23. In all of the cloth diapers we've tried, this has to be one of my favorites. If you're in search of a diaper that is trim and fits well under baby's clothes, then this may be the diaper for you. This diaper has a TPU outer layer and the inside is made of organic cotton. The GroVia All in One diaper is a one size diaper. This diaper fits a baby from around 10 lbs until 35 lbs. Hallie is 11 months old and weighs around 19 lbs. I absolutely love that this is a side snapping diaper and that the tabs are very stretchy. The fit works really well for my rather skinny baby, but would fit any size baby well. There is one sewn in liner and there is a snap in liner to use if your baby needs more absorbency. GroVia All in One diapers come in different colors and prints that you can check out on their website here. We've tried this diaper for short durations, nap time, overnight, and long car trips. We've not had one issue with any sort of leakage. I love that this is a trim diaper, but has all of the absorbency that Hallie needs. I was also sent the Magic Stick Z made by GroVia which is a cloth diaper safe diaper balm. Hallie is teething these days, so we've had some pretty nasty teething poops and that results in some sore rashes at times. The first time I used the diaper balm, I noticed how amazing it smells. I absolutely love that it has healing essential oils in it, as well as non-nano Zinc Oxide. This diaper balm clears up even the worse diaper rash quickly without using all of the harsh chemicals found in mainstream diaper creams. Plus, it's cloth diaper safe. I've teamed up with The Natural Baby Co. and some great bloggers to give away this great prize package! 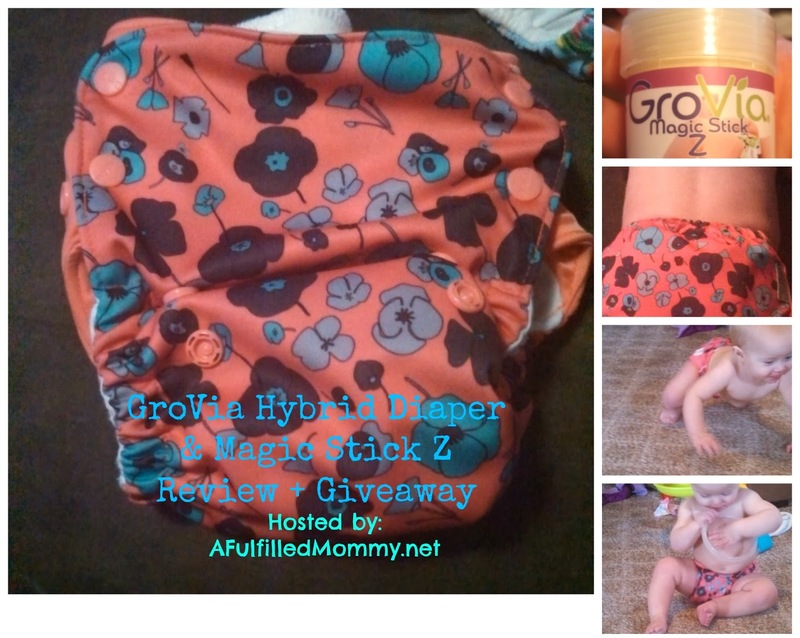 One winner will receive the GroVia All in One cloth diaper in Poppy, as well as the GroVia Magic Stick Z Diaper Balm. Use the entry form below. We at HappyGreenBaby love the cost savings of cloth diapers and we LOVE the new colors that GroVia offers. Jammy Jams is a fun, modern twist on lullabies for parents who strive to create memories with their little ones while teaching them a thing or two about their own style. Lullaby versions of your favorite Hip-Hop, Rock, Pop and More! Jammy Jams features lullaby renditions of songs originally by everyone from Jay-Z to Stryper, Eminem to The Fray, Lady Gaga to The Beastie Boys! In 2010, shortly after Jeff and his wife Lynn welcomed their son Rollins into the world, Jeff was inspired by his son (during late night feedings) to develop lullabies that would not only provide soothing, calming music for baby, but would also entertain the parents. On one late night in the winter of 2010, Jammy Jams was born! Read more about Jammy Jams HERE. Whether you are a classic hip-hop or alternative music fan or a connoisseur of rock, hair bands, or pop music, you and baby will enjoy this collection of lullaby renditions from a variety of musicians such as Daft Punk, Miley Cyrus, Fugees, Oasis, and Def Leppard. Expose your little one to multiple genres of music while effortlessly drifting off into dreamland. Listen to samples of these tunes HERE. LOVE IT! We love Jammy Jams, Greatest Naps, Vol. 2! Soothing, yet not too slow. Not just 'another lullaby'. I have to be honest, traditional kid music doesn't bother me - HOWEVER it drives my husband batty. He would have loved this music when our first child was born. But never too late - we believe in the power of music - and even our 7 yr. old is now listening to Jammy Jams at bedtime. Jammy Jams isn't just for bedtime either, it's great to listen to when the kids need some down-time during the day. And what a great gift for the next baby shower or little kid birthday party. We highly recommend checking out Jammy Jams, for yourself and for your friends & family! Let us know what you think of Jammy Jams! And now for the FUN part... A Jammy Jam GIVEAWAY! Enter to win! Have fun and Good Luck!!! Looking for a perfect baby shower gift? Introducing...Daddy Plays! Snuggly Lotion is perfect for the entire family! As our family began making changes a few years back to become more eco-friendly, I quickly realized the importance of healthy skin care products. That is about the time I came across the brand Babytime, by Episencial and I fell in love. Episencial combines advanced skin care technology with Actively Healthy™ ingredients including probiotics, neem oil and botanically-sourced essential fatty acids and antioxidants to enhance skin immunity and defend against daily environmental challenges from water, sun and air. Young kids are exposed to more contaminants in air, water, food, and personal care products than adults. Immature organ systems are often less capable of fending off chemical assaults. Did you know subtle damage to developing bodies now may lead to disease later in life? Babytime! by Episencial simplifies choosing effective, natural, safe skincare for your baby so you can focus on the little memories that are made during the most unexpected times. When changing a diaper, giving a bath, massaging baby to sleep or prepping for the outdoors, Babytime! by Episencial is there to help you Enjoy Every Moment! Products are designed for sensitive skin, made with all natural ingredients, many that are organic, and never made with bad chemicals. Products smell terrific from natural juice extract; no fragrances are used. All products are manufactured with solar power, never tested on animals, and are packaged in recycled and sustainable materials. Are you confused when you read skin care labels? It’s not just you. That is one of the reasons I love Episencial, they have and share their great resources to help end the confusion. Babytime! products are made with at least 70% organic ingredients, and are certified by the USDA. Working within this criteria, they are able to make completely safe, highly effective formulas exclusively with plant-based, natural or naturally derived, and predominantly organic ingredients. Now introducing our favorite Episencial product: Snuggly Lotion! This product is 'Tried and True' in our household! Lock in skin's hydration with this non-greasy nourishing moisturizer. Soothing borage seed oil helps boost skin immunity while avocado, flax, and primrose oils soften and condition delicate skin. Glides easily for smooth application - perfect for massage. Directions: Smooth onto face and body after bath. To renew extra dry skin, layer over Episencial Soothing Cream. Massage into scalp to help loosen flaky skin. Use alone or as a part of the 3 Step System for best results. Now, one of the reasons I LOVE Snuggly Lotion is because it's perfect for the entire family, not just your baby. I love it, my husband loves it, and it is perfect for my little girls. There is no smell, so you won't be walking around smelling like baby powder, or some other 'scent' formulated for babies. It's not greasy, which is also a huge plus for our family. And it's always nice to just buy one lotion for the entire family, not two or three. Another reason I LOVE Snuggly Lotion is that EWG Skin Deep Cosmetics Database gives it a safety rating of 1 (0 being the lowest, 10 the highest... 10 is BAD!) Take a look. You can purchase Snuggly Lotion at HappyGreenBaby.com, among other Episencial products. Take a look at Snuggly Lotion HERE. Let us know what you think of Episencial's Snuggly Lotion! Brittleby's Corner, a blog devoted to organic living, is hosting a $35 eGC Giveaway to HappyGreenBaby.com! Take a peak at her post (posted below) and then head over to her blog to enter. It's EASY to enter - Just take a look at HappyGreenBaby.com and tell us what your favorite item is on the website. Post your comment on Brittleby's Corner and GOOD LUCK! If your family has decided to live a green and healthy lifestyle, then let me introduce you to Happy Green Baby. Happy Green Baby is a family run and operated online boutique with some of the best eco-friendly and sustainable products for your family, especially your baby. They handpick specialty organic and natural products with a commitment to lessening impact on the environment. I love the company’s philosophy because I totally agree with it: When we make small changes every day to lessen our impact on the environment, we make a difference. When you choose to start living a more eco-friendly lifestyle, you must take baby steps. You can’t change everything in one day. My advice to people has always been to pick one or two things that they want to see changed the most, then do it. As time goes on pick a couple more things to change. Eventually you don’t have to try so hard to green, you are doing it naturally everyday! One of the best places to start changing is with your baby! Happy Green Baby carries clothing, nursery furniture, toys, bath and skin care, stuff for moms, essential oils, feeding time goods, and more. These products are made from recycled materials, are BPA free, don’t contain chemicals, are reusable…the list goes on. Every product is carefully selected from trusted brands and featured proudly in their store. If you are looking for a baby shower gift, Happy Green Baby would be your one stop shop. If you are new to living an eco-friendly lifestyle or are just interested in learning about more green ways to live, then visit the Happy Green Baby’s Learning Center. You can also subscribe to their blog for more helpful tips and tricks. Use code “THANKFUL” for 20% OFF your purchase on Happy Green Baby. Happy Green Happy would like to give one of my readers the chance to win a $35 e-gift card. This Giveaway is open to US only and ends 12/5. You must visit the site and leave a comment with the name of a product; please don’t be generic with your answer! Good Luck and thanks for following Brittleby’s Corner! If you currently use cloth diapers you may have heard of Glow Bug Cloth Diapers. If you are new to the cloth diapering world you will want to check them out. Cloth Diapers are a fantastic way to be eco-friendly and save money - it's a win-win. Glow Bug Diapers are super cute, work great and they are less expensive than other brands. Glow Bug Cloth Diapers with The Revolutionary 360° Gusset are ideal for first time parents looking for an easy cloth diaper solution. You do have to get them in a package, the price is $150 for 12 diapers (approx. $12.50 a diaper), 18 microfiber inserts and a wet bag. Although I think it would be nice if you could buy singles, or at least smaller packages, the price you are paying for the set is a great price. Price - Glow Bugs are less money than other brands. Fashionable Prints - Get 12 diapers in stylish prints - Boy, Girl, or go Neutral. One Size - Fit Babies from Newborn to Potty Training. Eco-Friendly - The best reason of all. Glow Bug Cloth Diapers only come in packages - boy, girl, and gender neutral. The prints are so colorful, not what you imagine when you think "cloth diaper". The Revolutionary 360° Gusset - 360 degrees of protection! One thing I really like about the Glow Bug company is their resources for parents. Cloth diapering can be a bit overwhelming when you start out, but they have video's to watch and material to read to lessen the overwhelmed feeling a bit. They also have a referral program - take a peak HERE. Please take a peak at our LEARNING CENTER. Looking for a perfect baby shower gift? Want to show up with a one-of-a-kind gift, one that will last? Look no further! Introducing...Daddy Plays! They make lullaby CD’s using real acoustic instruments that parents can also enjoy. They offer an alternative to the common, computer generated, lullaby sound. Daddy Plays was founded by a father musician with the insight that lullaby CD’s are indeed made for babies but parents share this music with their baby all the time. They make music that is designed to help your baby relax and fall a sleep but won’t make you want to tear your hair out! Acoustic Rock Lullabies: Celebrates some of the most memorable and melodious acoustic guitar moments in rock & roll history. Now you can share music by: The Rolling Stones, The Beatles, Simon And Garfunkel, Led Zeppelin and other acoustic guitar masters with your baby. Sleepy time has never been so cool! Guitar Lullabies: More than just beautiful music! This Award Winning album was created to be comforting for infants yet also relaxing and enjoyable for all children and adults. This unique collection of bedtime favorites and original compositions promotes a shared experience between baby and parents and makes for a great baby shower gift. 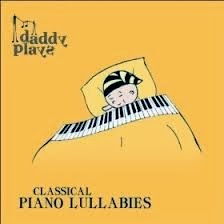 Classical Piano Lullabies: Awonderful way to introduce your baby to the soothing sounds of acoustic piano and the profound genius of our greatest composers. Edited and arranged for a restful experience, these solo piano pieces are beautifully performed for babies and parents to share and enjoy together. Daddy Plays Christmas Lullabies: A collection of holiday classics that bring the joy of Christmas into your home. Share the sounds of the season with your baby, make Sleepy Time part of your family’s holiday experience. Give The Gift Of Music! All four versions are available at HappyGreenBaby.com, and are on sale this week! Take a moment to read a recent review (below) by An Angel's Kiss. This is a lovely album of classical piano lullabies that is perfect to soothe and comfort expectant mother and her baby. When baby is born these lullabies will continue to nurture the emotional needs of the baby and mommy. What I really love about this CD is the classical element. I adore piano too. The entire family settles down when this album is playing. Perfect for those who have a difficult time sleeping, a common part of pregnancy. Some experts say that music has a profound effect on fetuses and that newborns can recognize music their parents played for them when they were in the womb and even perk up or fall asleep when they hear a familiar song. Some also say that fetuses breathe in time to music they enjoy. California obstetrician Rene Van de Carr says he's observed a 33 week old fetus pattern his breathing to the beat of Beethoven's Fifth Symphony. Aden and Anais make the best swaddle blankets that I can find. They are the softest swaddle blanket on the market, made of muslin they allow baby's body temperature to regulate itself. This swaddle blanket is chemical and pesticide free. The muslin a is light open weave fabric with a rich and lengthy history in many cultures. These award winning wraps are woven with 100% organic cotton muslin certified by GOTS - global organic trade standards. The global industry organic certification leader is environmentally and socially responsible for manufacturing. Aden and Anais wraps are produced with 100% organic cotton and the entire manufacturing process uses organic practices, including the use of recycled water. 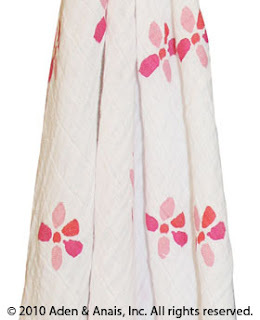 Everyone wins when you use the Aden & Anais swaddle - baby, mother, the environment and humanity. same organic cotton that is included with it. Highly Recommend! For more information, please visit Happy Green Baby. Thanks to An Angel's Kiss for a wonderful review! We love Aden & Anais because they make wonderful products! If you haven't already, check out their fantastic line of Crib sheets (organic cotton or bamboo), Swaddle Blankets (organic cotton or bamboo, single or triple packs), Mum & Bub skin care line, Burpy Bibs, Security Blankets and more!! !